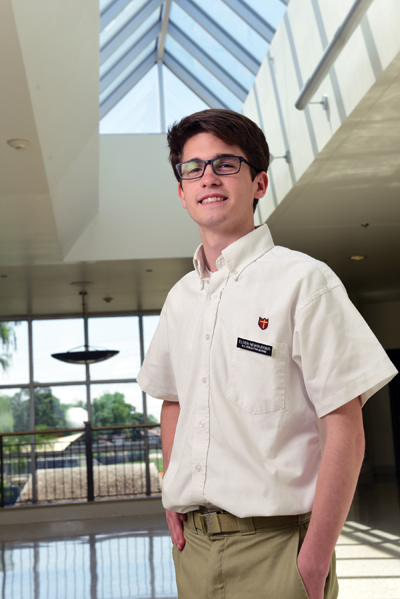 “The more we attempt to improve our community, the more the community will improve; and if the community improves, there will be a positive effect on not only me but also all the people around me,” says Elden Patrick Newburger a graduated senior from Brother Martin High School. Newburger’s most rewarding experience has been through his involvement with Teen CROSS (Catholics Reaching Out in Selfless Service), through which he led the junior high session of World Youth Day. “The young Church is the Church of the future, and without them the Church will inevitably fail. Seeing so many young people join together to celebrate their faith and learn more about it brought so much fulfillment to me,” says Newburger. During the summer of 2015, Newburger assisted to revive Relay for Life in New Orleans. The event, a 12-hour walk, has students from all the areas schools come together to raise money to fight cancer. That summer, he was asked to be one of the three Masters of Ceremony. After Relay for Life was suspended due to lack of leadership, that year’s relay was a huge success and continues to be a successful event. Newburger worked with the group for the summer of 2016, but had a more behind the scenes role. “After losing my grandmother to cancer, it became an extremely important issue to me, so involvement in raising such a large sum of money for that cause meant the world to me,” says Newburger. Gerald Ursin, a teacher at Brother Martin, inspired Newburger to become a student activist. Ursin is a strong pillar for students to lean on and gives students motivation to keep pushing and working towards a goal. Newburger is attending Auburn University in the fall to study either mechanical or aerospace engineering. Once he graduates from college, he wants to become an engineer and, after gaining a few years of experience, open his own engineering firm.